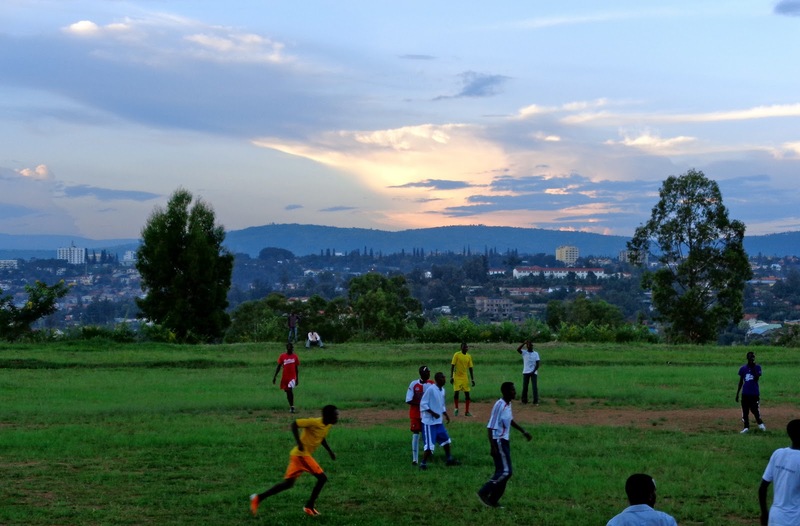 Adventures in Africa: The Serena, the staring, and the beautiful game. As I mentioned yesterday, we decided to treat ourselves to a nice dinner in town last night. 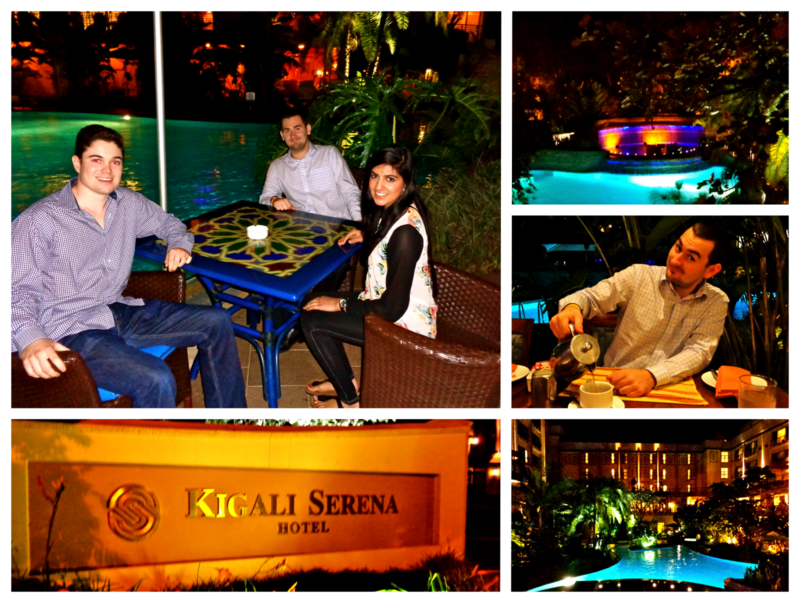 We ended up visiting the Kigali Serena Hotel, and let me tell you, it is a gem. Before the taxi had even stopped, we felt transported into a tranquil paradise. The five-star hotel is extremely luxurious and posh, but is designed and decorated with African motifs and art, so as to remain authentically Rwandan. We splurged on our dinners at the poolside restaurant, and it was the best food we've had all trip. Although we were stuffed, we made room for dessert, and Chris fell in love with the French-pressed Rwandan coffee. Today was Jamie's turn to teach the class, and he did a great job! The students were unfortunately pretty unprepared today, as most hadn't read the case beforehand. Thankfully though, it was a fairly qualitative Marketing case, and therefore once the discussion passed the initial understanding of the company, the students were more engaged. After class, Chris and I made our way to the student canteen for lunch. We last ate there at the beginning of our trip, and have since learned about the social implications of where students eat their lunch. 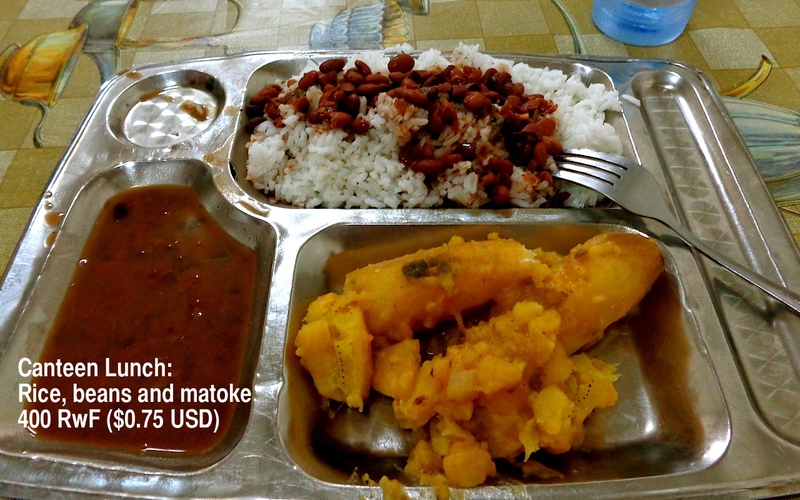 Downstairs in the canteen is the cheaper option, where students with meal plan cards can get one meal a day, for 400 RwF each (around $0.75 USD). Upstairs in the makeshift restaurant is where the more wealthy students eat, as well as some faculty members, as it costs 1000 RwF per buffet lunch. Both operations are student-run, but the gentleman who runs the canteen downstairs is so nice to us every time we run into him on campus. We therefore were excited to go back to his canteen and show our support, especially now that our stomachs are more used to the traditional meals. People stared at us (even more than usual) as we were waiting in line, but then our friend the manager showed up, and he was absolutely elated to see us there! He gave us the student discount, even though we don't have a meal plan card, and was still beaming when we finished our plates! We will definitely make the effort to eat there many more times throughout our stay! The boys then napped for a bit, while I reconnected with the world of social media… At 5pm we headed to the soccer (or as we're supposed to call it, football) field, to watch our friend Regis' soccer game. It was an annual tournament of the genocide survivors' club, where each "family" that I mentioned in previous posts, makes up a team and competes in a friendly fashion. It was a beautiful sight, as the families were so supportive of one another, their soccer (football) skills were incredible, and the sun was setting against the hills behind the field, creating the perfect backdrop! There was also a choir practice happening up the hill, so it honestly felt like we were watching an inspirational movie, complete with an African soundtrack. Reflecting on this long post, I am thankful for the great moments that we experienced over the last 24 hours. I'm learning so much, and cannot wait for the moments that are to come!